Places that offer both tranquility and adventure are like rare gems. Not everyone who seeks them can find one. In the Canaries, though, there is one in the north of La Oliva in Fuerteventura. It has a rough landscape with gentle contours formed by the wind and the turquoise sea that surrounds it. It is Lobos Island, the most mystifying in the whole of the Canaries. Before any man arrived in what we now call Isla de Lobos, sea wolves dwelled in this hidden paradise. All that changed when Jean de Béthencourt conquered Fuerteventura in 1405. The once untouched islet became a resupply base. Sea wolves were also mercilessly hunted for their meat, fat, and skin. Because of the massive scale hunting, the very reason for the island’s name no longer lives in it. 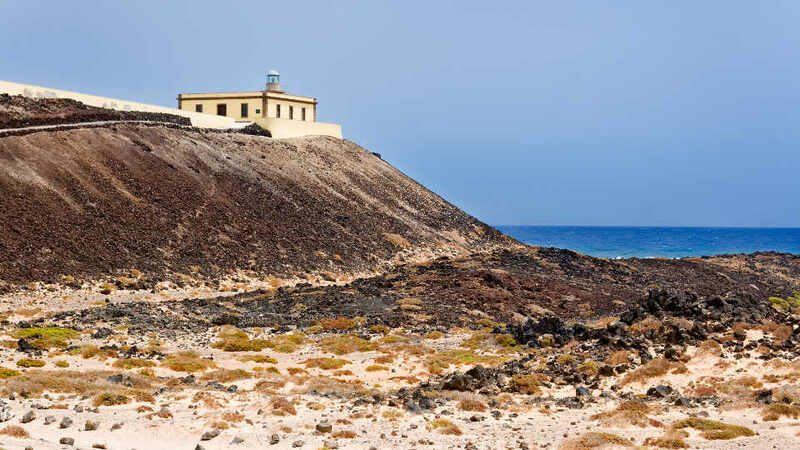 When Fuerteventura’s eventual fall happened, Isla de Lobos was left disused. In 1865, the Punta Martiño Lighthouse at the northern tip of the island, one of the oldest in the Canaries, was opened. Although it was unoccupied for centuries, a change did come in 1968. It was then that the faro keeper, together with his family, moved to the island to operate the lighthouse. His name was Antonio, and he even gained prominence in Corralejo. In fact, a school was named after him. The more recent decades have been very kind to this oasis. In 1982, it was classified as a nature reserve and renamed Parque Natural las Dunas de Corralejo e Isla de Lobos. By 1994, it was reclassified as a separate nature park from the Corralejo Dunes and was finally renamed Parque Natural Islote de Lobos. The 6,000- to 8,000-year-old Lobos Island is a tiny paradise with small but limitless natural beauties. Because of its pristine state, the island has been popular with tourists. Even so, it never has a swarm of visitors. And, as it is a protected sanctuary, intact natural spectacles fill the island. After a short boat ride, visitors disembark at the island’s small port. The few rocks sprinkled around its equally rocky shore form lovely natural sea pools. Aside from the breathtaking Playa de la Concha, many tourists swim here too. Enjoy the view of the bouldered bay and the vast blue sea. Also, delight in the sight of the handful little houses dotted on the rough landscape. These abodes are either whitewashed with blue doors or with volcanic rock masonry. Some are occupied all year round, while the others are used as summer homes. For a glimpse of what a truly simple life is, stay a little bit longer in El Puertito. From El Puertito, a 3.5 km walking trail leads to Punta Martiño Lighthouse. Up and running by 1865, it is one of oldest in the entire archipelago. Its age, though, only proves that is a timeless beauty. With a one-story house affixed to a tower of volcanic rock masonry, it is a classic charmer like the other 19th century Canarian faros. The dark, rugged hill it stands on captivatingly contrasts the glimmering azure ocean. So, if the lighthouse itself doesn’t impress, the postcard-perfect panorama for sure will. It’s an enduring spectacle on a serene oasis which makes it a definite must-visit. The Montaña La Caldera towers above the whole island at 127 meters high. From El Puertito, the trail that leads to the foot of the ancient volcano is suitable for all ages. It is rough but not at all bumpy. The ascent to the mountaintop, though, is short but can be quite challenging as the path is rather narrow. 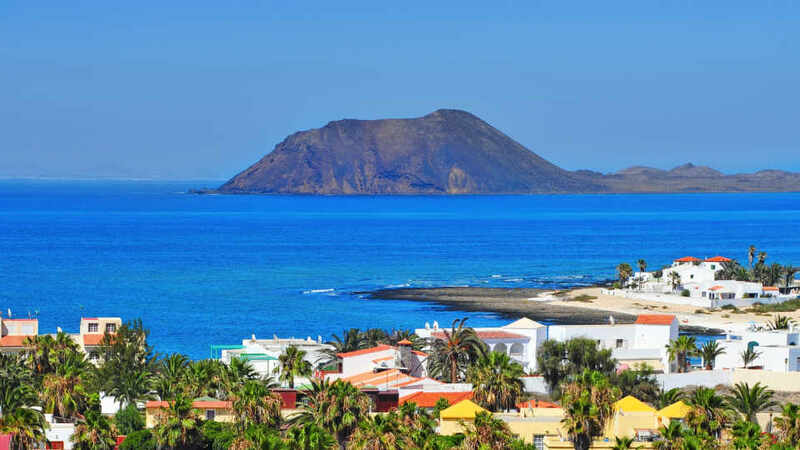 From the peak, the little island, the resorts and dunes of Corralejo, and even Lanzarote can be admired. Unfortunately, access to the summit of La Caldera is no longer allowed. To be permitted, tourists must get authorization from the Cabildo de Fuerteventura. Needless to say, the extra effort is well worth it. Most tourists visit the Canaries for its breathtaking beaches. And, it seems that the hordes of beachgoers skip Lobos Island because it’s known to have craggy shores. The Eden surrounded by dazzling waters has a secret that would change their minds though. Only a 15-minute walk away from the port is Playa de la Concha, a secluded and marvelous white sand cove. Its semi-circular bank acts as a breakwater that protects the bay from harsh waves. Aside from its calm waters, the island’s all-year-round sun makes it an even more ideal seaside getaway. For those who want to escape the hustle and bustle of the famous Canary resorts, this is the best beach escape. The Lobos Island or Parque Natural del Islote de Lobos is a protected area. As such, its diverse flora and fauna thrive in its volcanic landscape. For them to further flourish, tourists must stick to the paths and areas where they are allowed. Restricted zones are restricted for a reason, and must be respected at all cost. The island may look more like a desert, but it is home to more than 130 plant species. Floras such as the Sea Uvilla, White Caleton, and Siempreviva are the most beautiful living accessory to a seemingly arid landscape. It is also a sanctuary for birds that nest on its cliffs and rocks. Amongst its feathered residents are shearwater cinderellas, little shearwaters, herring gulls, yellow-legged gulls, storm petrels, and Bulwer’s Petrel. A couple of fish species like the barracuda, bream, Canarian fish, hammerhead shark, and striped fish also dwell in the waters that surround it. For those who want a rain-free hike, avoid visiting between November to January. The most rainfall occurs on those months and trails can be muddy. There’s only one restaurant on the entire island, so bring plenty of water and snacks. As visitors, remember to bring back what was brought to the island. Most people love to bask in the glorious Canarian sun but wear sunscreen as there are few shades around. After all, no one wants to get toasted. Lobos Island has plenty of sights to offer, but it lacks dining options. As a matter of fact, the only restaurant is Restaurante Antoñito el Farero. This humble food establishment is owned by the son of the original lighthouse keeper. The place is often packed with diners so there might be a waitlist. Before sauntering around, consider booking a table first to avoid a long wait. For their best-sellers, try their fried fish and paella. At the moment, there’s no direct bus from the Fuerteventura Airport to Corralejo. For less hassle, though, tourists may opt for car hires, taxis, or airport transfers. These options are especially popular with families traveling with kids. Those who will hire a car must go north via FV-2 to Puerto del Rosario. On the exit, take FV-3 then FV-1 at the northern end of the capital. 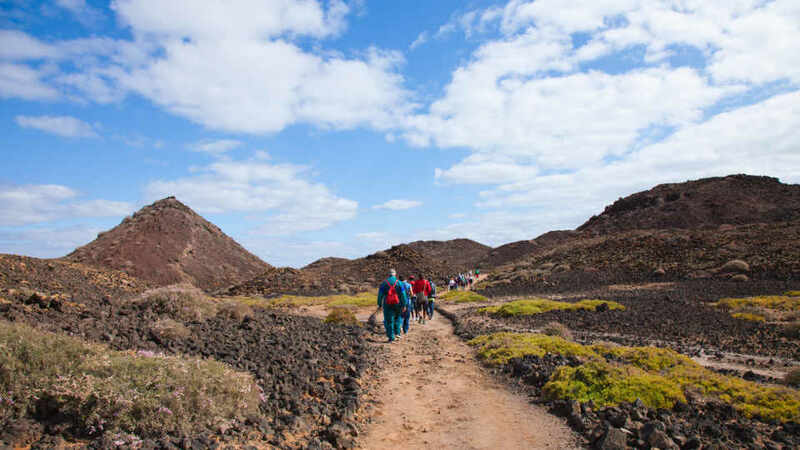 From there, follow the coastal route which leads directly to Corralejo. For those who prefer to ride a bus, take bus line 3 from the airport to Puerto del Rosario. From the capital bus station, take bus line 6 to Corralejo. This option is most popular with people traveling alone. It also the cheapest as it only costs only around €5. From the harbor of Corralejo, tourists must take a ferry to Lobos Island. At the moment, there’s but one ferry company that services this route. Tourists can take the 15-minute boat ride (each way) to the island or go for the one-hour excursion. The latter includes equipment for snorkeling and drink on board. The Lobos Island is between Fuerteventura and Lanzarote. Around these two giants, the desert islet has gone unnoticed until very recently. Those who have been on its shores and traversed its landscape are surprised. How can such a stunning stretch of land go under the tourism radar for so long? Well, that is both puzzling and something to be thankful for. It was declared a protected area before the outside world took notice. For this reason, its natural beauty remains unblemished. It was a hidden treasure that is now an open secret amongst those who love nature and tranquility. It’s a paradise that missed the tourism bus, and we couldn’t be more grateful.